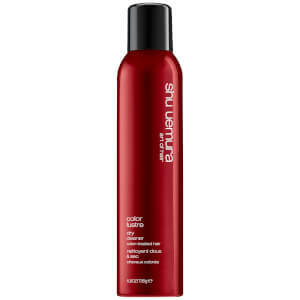 Revive your style between washes with the Shu Uemura Art of Hair Colour Lustre Dry Cleaner; a dry shampoo ideal for post-workout, travelling and transforming hair before a night out. Catering specifically for colour-treated hair, its translucent micro-fine powders absorb excess oil and banish any signs of grease to refresh lack-lustre locks and eliminate odour or product build-up. Expect revitalised, touchably soft tresses with enhanced vibrancy and zero residue. Suitable for all hair types. Ideal for men and women. Create a part on dry hair. Shake well before use. Spray dry shampoo 8-10 inches from roots. Repeat gesture on multiple sections as desired. Brush or use fingers to distribute product evenly. Butane, Alcohol Denat., Propane, Aluminum Starch Octenylsuccinate, Diisopropyl Adipate, Butylene Glycol, Disteardimonium Hectorite, Quaternium-91, Cetearyl Alcohol, Cetrimonium Methosulfate.